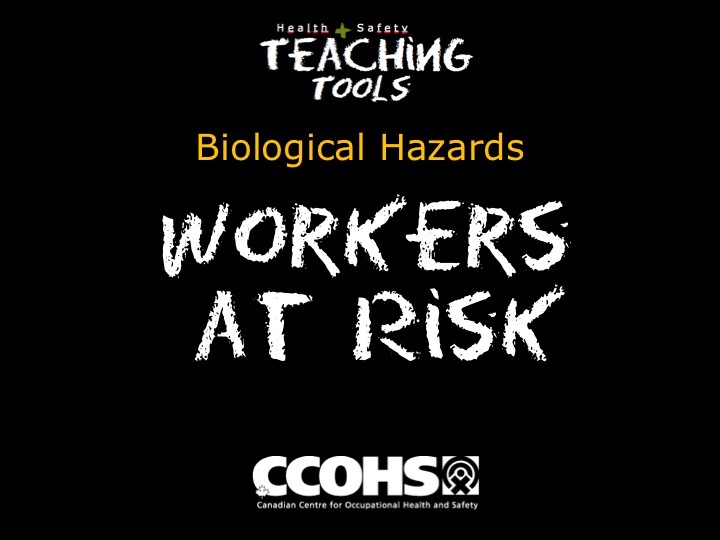 There are many work environments which put people at risk of exposure to biological hazards. When working with children and adults be aware that there are a number of infectious diseases, which can be transmitted casually from person to person, such as colds, flus and pneumonia. Some diseases such as E.coli or Salmonella can be spread from hand contact with dirty surfaces, which have been contaminated by these bacteria ? such as kitchens (from raw meat contact) or toilets (from human waste). Hepatitis and AIDS are usually the result of exposure to infected blood or from contaminated needlestick injuries. Hairnets ? worn to keep food clean - people lose 50 hairs a day! Dust Mask ? where dusts or mists should be avoided. Biological Containment Hoods ? may be required for some biological samples in labs or hospitals. 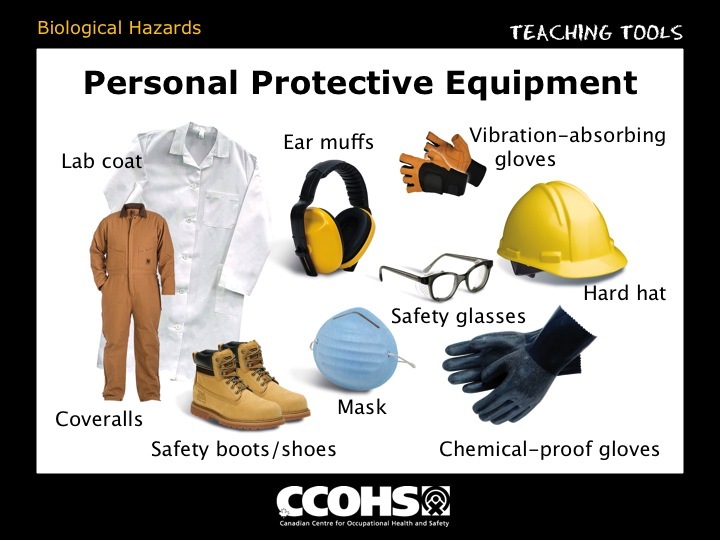 Not all PPE shown helps to protect workers from "biological" hazards. 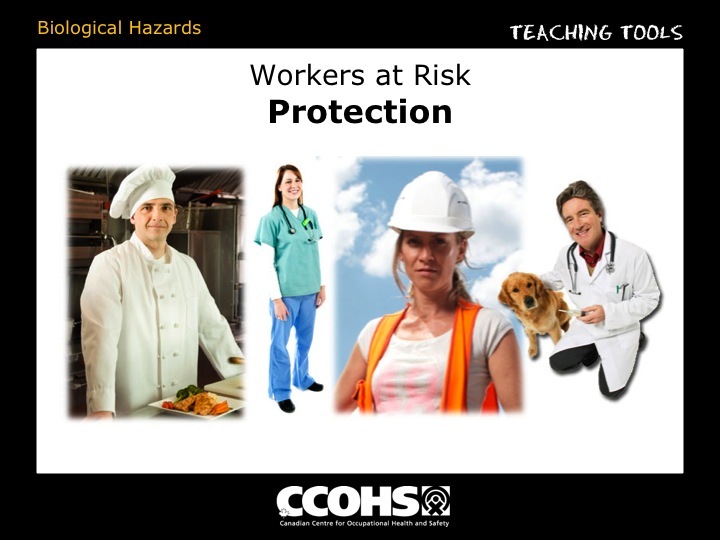 Here are some examples of how people in different workplaces may wear different PPE. 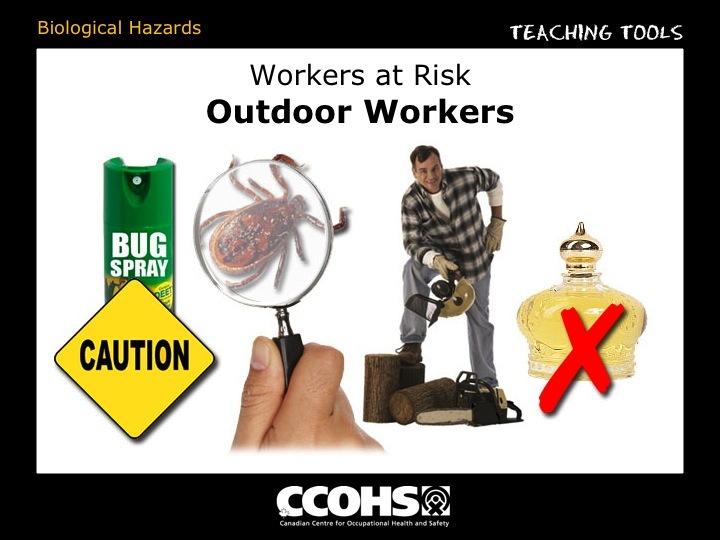 People who must spend a lot of time outdoors in forests and campgrounds as part of their job may be exposed to outdoor biological hazards, such as lyme disease or stinging insects. Lyme disease is prominent in Ontario as well as throughout Canada since it can be carried by ticks which infect deer, mice and humans. Stings by insects can result in localized pain, redness, swelling, and in some people allergic reactions which can be life-threatening. If you are allergic to insect stings be sure to inform your employer prior to working outdoors. If you see signs of reaction in yourself or a colleague, call emergency medical services immediately. WEAR light-coloured clothes to avoid mosquitoes and black flies. WEAR long pants, socks and shoes in grassy areas to avoid ticks. USE insect repellents carefully ? especially if they contain the chemical DEET. AVOID wearing perfumes, colognes and scented soaps or powders ? insects are attracted to fragrance.